Three FOs or is it six? Long in the making, the green socks are for Miss Four. 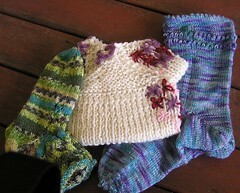 They are from the cheap sock yarn from Lincraft. I've done one feather and fan for me from the ball and couldn't be bothered with the second one, so started somethng small. Unblocked, you can hardly see a leafy lace pattern which was easy, but really needs plain, not variegated wool to show the pattern. She likes them which is strange as her only colour at the moment is - you guessed it- pink! She even asked for a pink drink when we had lunch out together the other day. The blue is 4 ply merino from the Knittery.I've been doing them for ages at work where I have constant interruptions. A picot hem and two rows of eyelets. Again unblocked, not even pressed. And another pair of pocketbook slippers for a friend suffering cervical cancer who is having lots of hospital/doctor visits. I madethese a bit smaller than the black ones below. Increased to 19 stitches instead of the 22 before doubling the number and doing the foot. Both socks had the legs done on 2.75 mm dpns and I went down to 2.25 for the foot for a better fit and tighter fabric.